It is hard to believe that our last post was in early August. 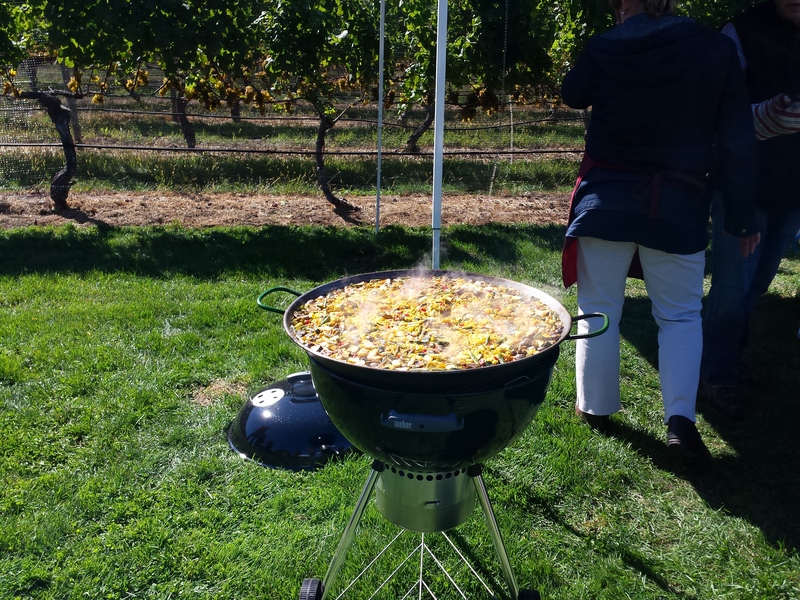 The steadily beautiful weather of August and September here on the East End has become intermittent, but we were all rewarded with sunshine and modest breezes on Sunday, October 5, at the Palmer Vineyards Wine Club Paella Party. Paella is a rice dish from Spain that has become very popular and is known around the world. It originated in the fields of a region called Valencia in eastern Spain. Valencian people prepared the dish with whatever ingredients they had on hand – rabbit, snails and vegetables. Today paella has spread to every region of Spain, using just about any kind of ingredient that goes well with rice! Miguel Martin, Palmer’s winemaker, and his hard-working wife Ellen delivered some fabulous paella for a happy crowd of wine club attendees. Typically thoughtful, the Martins offered both traditional paella, loaded with delicious shellfish and shrimp, and a vegetarian paella alternative. In case you think that cooking two huge platters of rice outdoors is an easy task, it isn’t. Ellen and Miguel worked hard to turn out these delicious treats. Note the Weber, put to an unusual use. Announced at the summer wine club event and followed up with emailed invitations, it was no surprise that the wine club turned out in force. We saw many familiar faces, and made some new friends too. October harvest parties like the one at Palmer attract visitors to the North Fork in droves. So do the many opportunities to pick pumpkins. The last mile of our trip to Palmer was bumper to bumper, taking 30 minutes to traverse. This time last year, we headed west to Liv Vodka, after failing to make any eastbound headway. The outdoor wine serving station was busy as members filled and refilled glasses. Marian and I went for Miguel’s Albariño, a delicious varietal native to Galicia, in northeastern Spain. Seafood is a mainstay of Galician cuisine, so no surprise here… the Albariño went great with the paella. So great that we enjoyed several glasses over the course of the afternoon. Miguel may be the only winemaker producing Albariño in New York State, so don’t pass up a chance to enjoy his hard work. Want to visit Palmer to try some of Miguel’s delicious wine? Perhaps thinking about joining the wine club? You can find Palmer Vineyards just east of Riverhead. Here is the address. The wine club secretary announced a traditional winter wine club party for December. Yes, winter will be here soon. Will we see you at the next wine club event? I hope so. Until then, enjoy your trip around town.